If you're just starting out, you may want to check out some free quilting patterns. The Internet is a wonderful tool for crafters because there are so many sites that offer free patterns for quilters and just about any other craft you can think of. Be sure to choose patterns that are compatible with your experience level. Once you have made a few quilts, you can choose increasingly more complex patterns. Keep yourself challenged but not to the point that you are frustrated. This site's name gets right to the point. At Free Quilt Patterns, you will find links to nearly 900 sites offering free patterns. The link list is updated regularly, so the links are always current. A great feature of this site is that in addition to links, it explains what kind of patterns are featured on each site, so you don't have to click on a lot of links that won't help you if you know you're looking for a particular thing. There is also a wide range of quilting styles featured on this site, from blocks to appliqué, crazy quilts to mystery quilts, small projects and wall hangings to rag quilts and T-shirt quilts. You can find an embarrassment of riches for quilters on the quilt block pages at Quilter's Cache. This site has nearly 50 pages of directions for quilt blocks of all sorts of sizes and degrees of difficulty. Not all of these patterns include instructions for making the block into a full-sized quilt, however. You can choose a block, decide how many you need to make the size of quilt you want, add borders, and make a truly customized quilt. Alternatively, you can build your own sampler by picking a dozen blocks that you like and combining them into one quilt. This site makes building samplers easy because you can browse the patterns based on the size of the finished block. That way, you can pick a bunch of patterns that make 12-inch blocks, and it will be simple to line them up and make a quilt out of a bunch of different patterns. The size of blocks offered ranges from one inch to about 32 inches, so you can truly make a quilt of any size using the instructions offered here. Free Quilt offers a good basic selection of free quilting patterns. Patterns are divided by motif, so if you're really wanting to do a cat quilt, you can find the patterns easily. This site also offers patterns and instructions for miniature quilts and appliqué techniques, if those are things you are interested in or want to learn more about. The selection here is not huge, but it is very well organized so you will be able to find what you want very quickly. If you're looking for quilting crafts specifically for Christmas, visit Christmas Craft Freebies. This site links to a bunch of Christmas-themed quilts and projects, from a 12 days of Christmas quilt to table runners, wreaths, and tree skirts. You could decorate your whole house in Christmas quilts with the patterns from this site! You can find all kinds of interesting quilting projects at All Crafts. Again, these are links from around the web. There are great links to information about how to quilt and other techniques here, too, so you will learn a lot by browsing through these links. One of the oldest quilting sites on the web, Quilt.com offers a wide variety of quilt blocks arranged by type or in an alphabetical list. Each block is illustrated in color, and the instructions are very detailed, making it easy to follow along even with the more complicated blocks. Again, these are patterns for individual blocks, which you can combine as you like to make pillows, wall hangings, quilts, and more. Once you've been quilting for a little while, you are bound to end up with a stash of scraps. 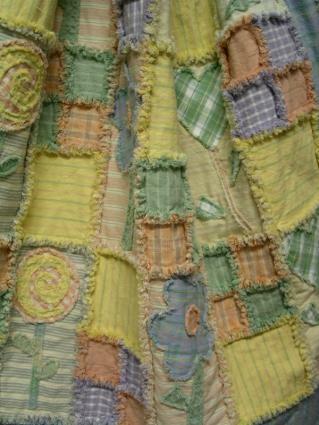 Check out Scrap Quilts for a bunch of ideas for ways to use those scraps that are beautiful as well as thrifty. When you find a pattern you like, be sure to print out two copies. This way, if you lose one, you will have another on hand. The patterns can be kept in manila file folders or large manila envelopes. Be sure to write the pattern name and the website address on the folder to make it easy to find. When you have access to free quilt patterns, you can plan a variety of quilt projects conveniently right from your computer. You'll spend less time shopping for patterns and more time quilting.